Lengthy waiting periods are among the most common citizen complaints regarding the Ontario Health Care system, and it's likely going to get worse as the boomer generation gets older. The Canadian system (including Ontario) of universal access to healthcare is often compared to our American neighbours, but the truth is, it bears little resemblance to it. It's a very bad comparison. Most democratic countries around the world have universal access to health care, but they do a far better job at delivering it than do Canadians. So lets compare those places to Canada, lets compare apples to apples. Here is an interview with Jerry Agar from Talk Radio1010 in Toronto. He will introduce Nadeem Esmail of the Fraser Institute. Please listen and watch. Here are two interviews that I was part of in August 2012. The first YouTube link below was from CFRA 580 Ottawa onthe 19th, the one below it was on CFRB 1010 Toronto on the 10th. Enjoy the "ads" below and to the right, produced and narrated by Allen Small on behalf of the Ontario Libertarian Party. Medical Care - We advocate choice and competition. 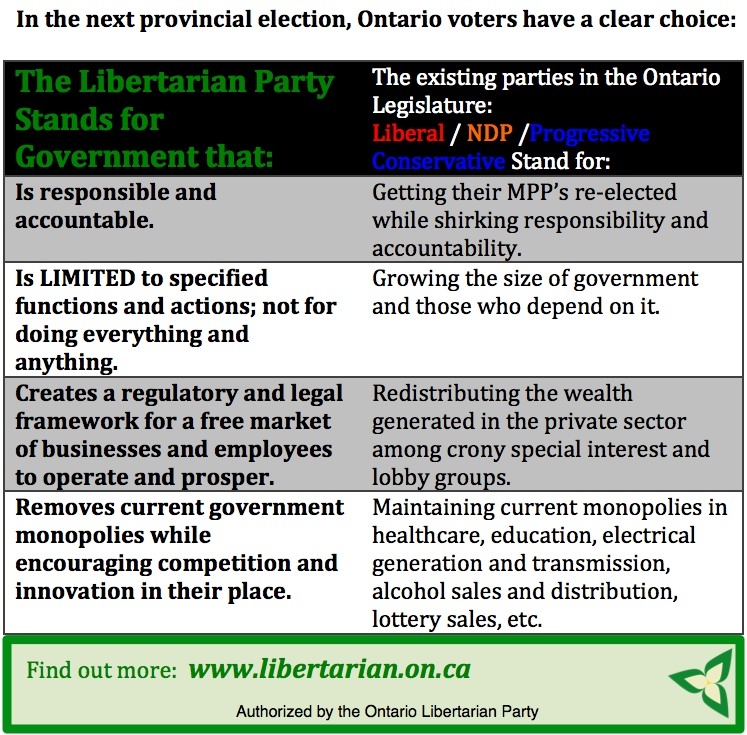 Libertarians believe that the government should not have a monopoly on electrical power generation in Ontario. Competition among producers would benefit the environment and the consumer. The two videos below review Ontario government propaganda. Across Ontario visit the Ontario Libertarian Party Website. DONATE YOUR SUPPORT by visiting the Ontario Libertarian Party Website. Ontario Libertarian leader Allen Small makes a brief appearance on local Rogers Cable-TV, as the results from by-elections in the Vaughan and Kitchener-Waterloo ridings stream in. Sept. 6, 2012. Education in Ontario: Moving to end the government monopoly. Electricity - We advocate choice and competition. Liquor/Beer - We advocate choice and competition. 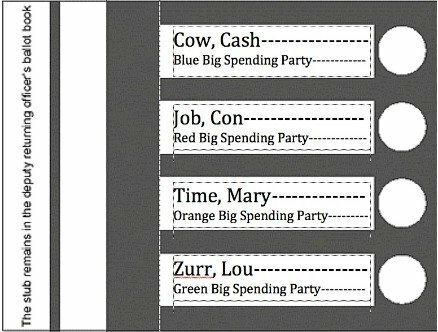 The mainline parties ALL act in the same way, the only difference being the colour of the party banner. Instead, choose LIBERTARIAN when you are called to vote. We will not buy your vote, we will not increase government spending, on the contrary, we will review policies and programs that are inconsistent with our principles. We will seek to limit the size and scope of government by eliminating Ministerial portfolios and entire Departments whose jobs can and should be done in the private sector. We will right-size government. We will reduce the need for tax revenue and as a result reduce taxes. Here is a radio interview where Allen Small was interviewed by Dean Blundell on the Edge 102.1 Toronto. It was aired during the federal election of 2011. We are none of the above. We prefer competition to government monopoly. We would not bribe taxpayers with their own money.